So, Christmas vacation is over and we are finally back to a normal routine. (well, as normal as it gets.) It wasn’t my intention to take such a long break from the blog, but I’m back now. A few days after we got home, we rearranged the furniture in the master bedroom. I’d been having a few issues with the room—like not wanting to spend any non-sleeping time there, and having clothes pile up on a chair as a result. This was bothering me. My husband also stated that he didn’t like being in the room much, except when sleeping. We had our bed and the baby’s crib in the room, and it turned out all that was needed was to move both of them over a few feet so they were against a different wall. Now the room seems spacious, I actually cleaned it, and you know what? Last night I hung up my clothes before I went to bed, instead of just throwing them on a chair. Now some people make fun of women for rearranging furniture, but this experience, combined with a podcast I listened to lately (highly recommended), made me realize that rearranging the furniture isn’t a frivolous waste of time, but can actually be a fantastic tool for self-control. Typically, bad habits involve following the path of least resistance. When we feel energetic, enthusiastic, and fresh, we can make all the decisions we want, and make good decisions, but, like water flowing over a surface, humans tend, when they are tired, not paying attention, or depressed, (and most of us are in one of these states most of the time) to seek the lowest point, travel the same well-worn paths, and break no new ground. Making decisions can be exhausting itself. According to Inc.com “It’s said the average person makes 35,000 decisions every day.” Some people react to this by making the more trivial aspects of their lives as routine as possible. Former President Obama was an example of this. He only wears gray or blue suits, so that he doesn’t have to think about that aspect of his life. The way he put it was, “You need to focus your decision-making energy. You need to routinize yourself. You can’t be going through the day distracted by trivia.” Whether or not you agreed with the former president’s politics, this is something that makes sense. So what does decision fatigue have to do with rearranging the furniture? Well, every time you walk into a familiar room in which everything is the same as it was before, all your routines for that room kick in. Sometimes these routines are helpful. You don’t have to think about turning the light switch up for on and down for off. This is something your brain has routinized; you don’t have to consciously process it. But sometimes our automatic routines are less useful, like dropping clutter on a particular chair or table, or turning on your TV the moment you walk in. Or just leaving it on all the time. Or wasting time on social media all day long on your phone. We do these things, not because we have consciously chosen to do them, but because they are easy and automatic. So the key to changing these habits is not to use more will-power—we only have a limited amount—but to to make them less easy and less automatic. This is where rearranging the furniture comes in. Do you have a piece of furniture that collects things? (I used to have this problem with the kitchen table. You can read about how we fixed that problem here) Why do the things go there instead of where they’re supposed to go? Often you will find that the clutter-collector is on the way to the place for the things it collects. Or sometimes the clutter-collector is in a logical place for those things, and should be replaced with something designed to store those things. In the first case, moving the piece of furniture can solve the problem. In the second case, it should be replaced with something else, perhaps some other under-utilized object you already have in the house. Do you have a habit you want to change? How about constant snacking? Even something as simple as putting your snack food on a higher shelf can make a difference. Or putting healthier snacks in places where they are easier to grab and less healthy snacks in more out of the way spaces. If you are watching TV more often than you want to, an option is rearranging the furniture in your living room so that it doesn’t center around the TV. If the furniture doesn’t make you face the empty screen, it won’t tempt you to fill it. But what will you replace your TV watching with? Rearranging furniture into a conversation circle can do wonders for your family social life. What else can we change? What I discovered by rearranging my bedroom furniture was that I hadn’t wanted to spend time in that room because the furniture was near the door, and so in order to move into the working space of the room, you had to walk past or around the furniture. It was not difficult except psychologically, but I never wanted to do it. In a book of applied psychology I read that neighbors tend to be more friendly with the neighbors who are on the same side of the street and whose doors or yards face each other. It isn’t hard to cross the street, but people rarely do it if they don’t have to. How many things could we change in our lives, simply by rearranging the “furniture”? Is there an app you could delete from your phone that would save you time and energy? Would moving a chair or table make you exercise more often? 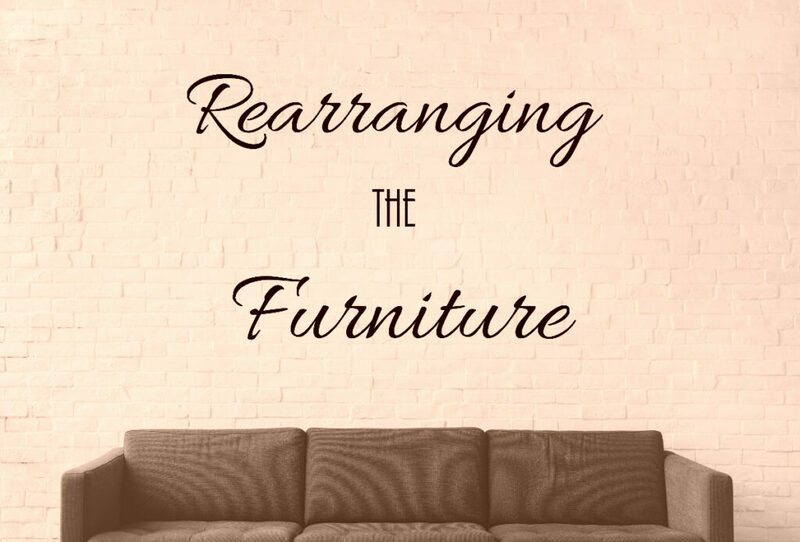 Instead of trying to use your limited will-power to help you make your life better this year, why don’t you think about what furniture your should rearrange in your life?